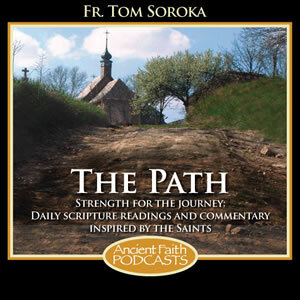 Listen to the daily scripture readings and thoughtful commentary with quotes from the Fathers and the lives of the Saints. It's strength for the journey, heard three times a day or whenever you wish from your computer or portable device. Hosted by Fr. Tom Soroka. Q: How are the readings chosen? 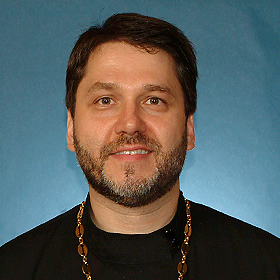 A: The readings are based on the lectionary published by the Orthodox Church in America. The daily readings are the epistle and gospel for the particular day (or the Vesperal Old Testament readings during Lent), without regard to minor feasts. However, we will read the appropriate readings for the 12 major feasts. Because of the length of readings for Holy Week, a representative sample will be chosen. Q: From what translation are you reading? A: The New King James Version (NKJV). Q: Why aren't you reading from an English translation of the Septuagint (Greek version) for the Old Testament readings? A: The only available English translation of the complete Septuagint is by Brenton published in 1851 and is not widely read. The English used is, at times, archaic, and we prefer to wait until an appropriate and readable version is published in English. Ideally, we want our listeners to have the printed version available to them to read along and for further study. Any major and relevant differences between the Septuagint version and the Hebrew version will be noted in the broadcast. Q: When the life of a Saint is given, how are they chosen? A: When time permits or the topic is relevant to the life of a Saint, one of the various Saints commemorated on that day will be chosen from many Orthodox traditions. Q: Where do you get your source material? A: There is a growing body of the commentaries of the Fathers and the lives of the Saints written in English. All reliable material is used. Q: Is a text version of the program available? Q: Are there plans to publish a book of the commentaries heard on The Path? A: No, but it is under consideration. Q: How long does it take to prepare one daily program? A: About two to three hours, including preparation, recording and editing. Q: Are there any plans to have weekend editions of The Path? A: At this time, only on an occasional basis. Q: Can we get the program published earlier for listeners in the Eastern hemisphere? A: We're trying our best to accommodate our listeners all over the world as our schedule permits. We haven't forgotten about you! Q: Does Fr Tom read the emails sent to The Path? A: Fr Tom reads and personally responds to every email. Q: How can I help promote The Path? A: First, by your prayers. Next, by sharing the program with others. Finally, by supporting Ancient Faith Radio.